Mac users mostly using Mac’s own iDVD to burn the Videos and Audios to the DVD. iDVD is not a complete solution for all kind of burning functions. A lot of Mac users feel the complications of using iDVD and its non-usability in some necessary situations. It leads to the search for an alternate source for the burning DVD in Mac platform. While searching for the DVD Burner for Mac, we found the Cisdem DVD Burner for Mac. The first thing that attracted us is the list of products from the Cisdem. They have Data recovery tools, PDF tools, Video converters, a set of utility tools etc. One thing cleared for us while looking at their list of a variety of tools that Cisdem is not a new player and have very well experienced in the utility software field. 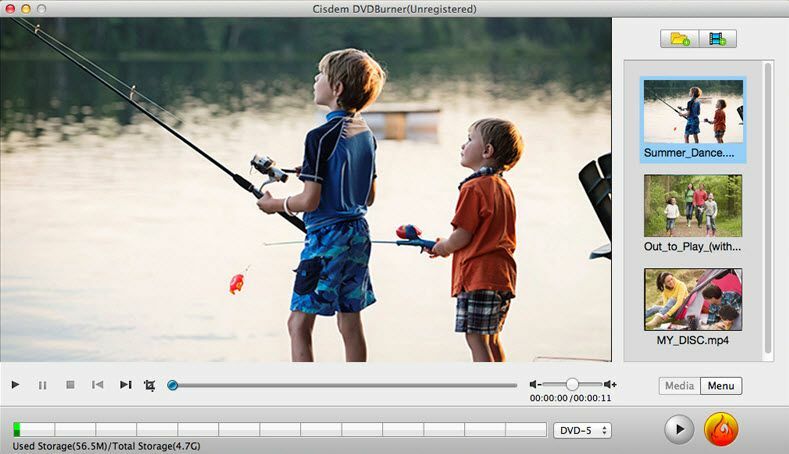 In this review, we analyze the Cisdem DVD Burner is the best DVD burning software for Mac or not. What Cisdem DVD Burner for Mac will do? Cisdem DVD Burner burns any Audio or Video to DVD. The difference of Cisdem DVD Burner comes from the compatibility and functionality it provides. iDVD has a lot of restrictions in burning certain videos. Cisdem VD burner supports videos downloaded from the internet, captured by Camcorder, iPad, iPhone or any device. The supported video format is also on the huge list. Practically, you can burn any video format with this DVD burner. Also, it supports Audio burning to DVD. Like the Video, it supports almost all audio formats to burn into DVD. TO enhance the experience of the DVD, it supports Subtitle files too. Cisdem DVD Burner supports a wide range of Video and Audio formats and also the video and audio captured by any device. It makes to burn video to DVD, without any complications and compatibility issues. Also, it burns audio to DVD in a very simple process. Supported Videos – Internet downloaded videos, captured from Camcorder, iPhone, iPad, and many other devices. It has a handsome pick of DVD menu themes. It gives us the option to add our choice for thumbnail, button, frame, and text. We can impress the DVD viewers with our pick of title thumbnail from the video. This DVD menu is given as an option to add to the DVD. If we don’t want the DVD menu, we can omit the menu option completely. Along with the video and audio additions, you can also add subtitle to the DVD using the Burner. This function will be helpful for making DVD videos with international exposure. We can add subtitle in different languages to increase the viewership. It supports the .srt subtitle format. 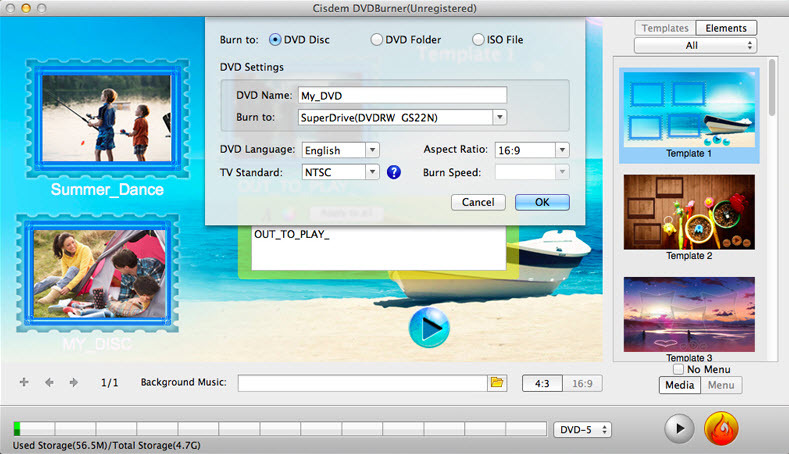 Cisdem DVD Burner burns videos and audios into DVD, DVD Folder, and ISO File. Also, it allows to set the DVD based on disc volume – DVD 5 and DVD 9 -, TV System – NTSC and PAL -, Display ratio – 16:9 and 4:3. DVD’s are playable in any DVD and BD players. All the test over the quality of the DVD confirmed that no degradation in video and audio quality. While some DVD Burners irritatingly reduce the quality during the burning process, Cisdem DVD Burner stands out the crowd without any change in video and audio quality. The real-time Preview option is available to check the quality of DVD before burns it. You can check the previews of video, Menu and chapter switch over. Amazingly Cisdem DVD Burner has a stunning fast Burning process. It works quicker than many other DVD Burners. We found that it is working with multithreading, multi-core processing, and multitasking DVD burning technology, which results in such a quick process. It supports the Mac OS 10.7 Lion, 10.8 Mountain Lion, 10.9 Mavericks, 10.10 Yosemite and 10.11 El Capitan. Also, you need the following requirements for the functions of DVD Burning. Official support is available for anyone through E-mail support. They have an extensive set of FAQ and instruction manual, which themselves solve most of the common doubts and problems. To retrieve the key code, just the registered and licensed Email or the order number is enough. Cisdem DVD Burner can be purchased based on a number of Mac you want to use with. They are selling the license for Single Mac, 2 Mac, and 5 Mac. The license is valid for lifetime and no need to renew or subscribe based on the period. All the licenses are eligible for free lifetime update. All the plans have 30 Day money back guarantee which can be availed if not satisfied with the product. 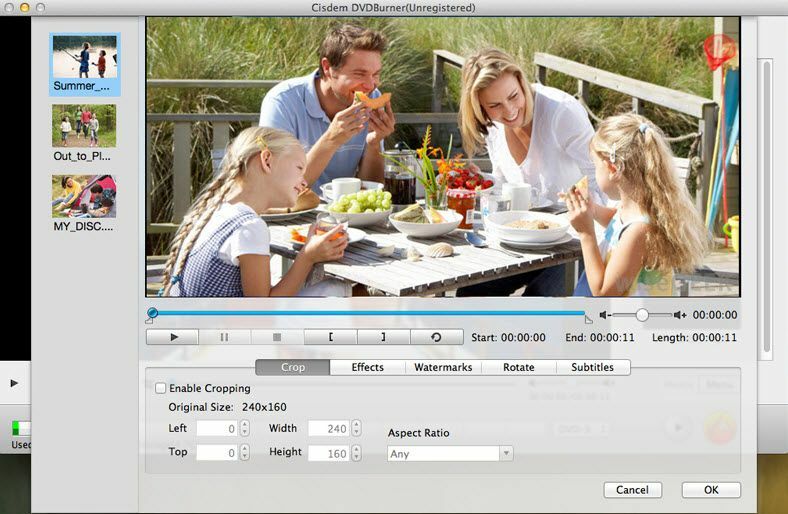 After the analysis, we are sure that Cisdem DVD Burner is one of the best DVD burning software for Mac. The Price is also reasonable with lifetime license and updates. If you want a DVD burner that burns with good quality and that provide a lot of DVD finishing options, choose Cisdem DVD Burner.